This "Welcome to Deutschtown" mural greets neighbors and visitors as you enter East Ohio Street from the west. In 1890, the population of Allegheny City was 105,287, of whom 30,216 were foreign born, and 12,022 were born in Germany. 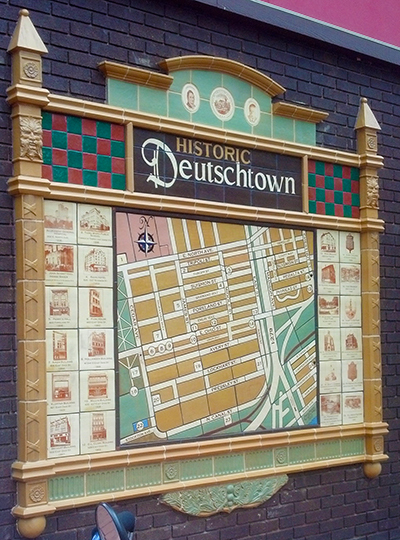 Deutschtown, also called Dutchtown, was the eastern expansion of the vital hub of Allegheny City (annexed by Pittsburgh in 1907), where the German-speaking peoples settled early in the nineteenth century. Mid-19th century East Ohio Street began at Allegheny City Hall (now gone), once the very heart of the North Side and, unfortunately is now an abandoned shopping mall. Then, East Ohio Street showcased grand three-story Victorian commercial buildings, becoming a bustling business district with a movie house, banks, clothing and food stores. To the north of East Ohio were livery stables, a blacksmith shop, wagon manufacturer, granary, and lumber mill. Until the 1850s, the Deutschtown area was largely farmland. Deutschtown, as we now know it, was developed from 1850 – 1920 as Allegheny City spread beyond the park Commons and the land was subdivided into residential lots for the ever-growing, mostly German, and then Croatian, population. At roughly the same time, neighborhoods developed north and west of the then Allegheny Commons Park – what is now the Central Northside and Allegheny West. Cedar Avenue became the residential showplace, where 9 – 14 room stone and brick houses would have a view onto the handsome new greenspace: Allegheny Commons Park. Housing was built amongst the businesses for a wide range of incomes, with the larger homes found on Cedar Avenue, Avery Lockhart and Pressley Streets. Medium sized homes (6 – 8 rooms) were generally located north of East Ohio, and small frame homes (4 – 5 rooms) were mostly located in alleys and ways. Take a historic walking tour of Deutschtown. Click here to access the PDF document. The Historic Landmark Map located on the corner of Cedar Avenue and & East Ohio Street features 24 landmarks throughout Historic Deutschtown. The 8” x 7” tile map is composed of more than 175 individual hand-painted and hand-crafted ceramic tiles, designed by Anders Anderson of East Liberty. The next phase of this project includes complimentary building tiles and a walking map.